I think I've been in denial that summer's coming to a close. Every year, even as I sweat my way through August (and apparently September this year), I start to get sad that I soon won't be able to run around in a tank top and shorts and will instead be bundling up in sweaters. But you know what has gotten me excited about the fall season this year? Y'all. 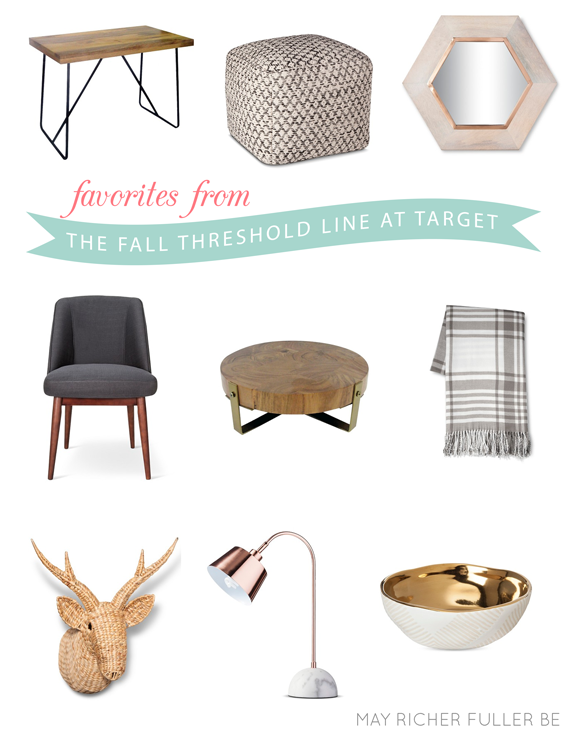 I'm kind of dying over the new fall line from their Threshold brand. There are just so many cozy, shiny, pretty, fall-like things. It's taking all of my self-control not to go fill half a dozen carts with items like this copper + marble lamp or this wood + metal bench. In my attempt to not spend all the monies, I decided to gather up all my favorites into a lovely virtual list and share it (very enthusastically!) with y'all. So please, enjoy, and I'm sorrynotsorry if you end up filling half a dozen shopping carts with all the pretty things. Who else (besides Emily Henderson and me) is excited about this line?